Soy biodiesel is a clean-burning, non-toxic renewable fuel made from soybean oil. Soy biodiesel can be used in any diesel engine without modification. Biodiesel fuel made from soybeans reduces greenhouse gases and particulate emissions and helps to lessen dependence on imported petroleum. Soy biodiesel is creating new opportunities for soybean producers across the country to market their energy crop. The North Carolina Soybean Producers Association has a biodiesel communications and promotion program aimed at increasing distribution and use of soy biodiesel in North Carolina. The association applauds the farm community for embracing biodiesel on the farm. 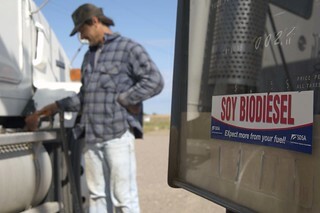 To find out if biodiesel is available in your area, call your local petroleum dealer and ask for soy biodiesel. Biodiesel is a clean burning alternative fuel produced from domestic renewable resources including soy and canola oils, animal fats, and other feedstocks. Soybean oil is the predominant feedstock for making biodiesel in the United States. Biodiesel contains no petroleum, but it can be blended at any level with petroleum diesel to create a biodiesel blend. It can be used in compression-ignition (diesel) engines with little or no modifications. Biodiesel is simple to use, biodegradable, nontoxic, and essentially free of sulfur and aromatics. Where can I find a soy biodiesel supplier or retailer? Visit biodiesel.org to find a list of thousands of suppliers and retailers across the country. You may also call the toll-free hotline 866-BIODIESEL (866-246-3437) for assistance finding a soy biodiesel pump or supplier anywhere in the country. How was soy biodiesel developed? U.S. soybean farmers helped develop soy biodiesel in the early 1990s through funding from the soybean checkoff — a collective investment of all U.S. soybean farmers that is used to research and promote products like soy biodiesel. Where can I find links to other biodiesel sites and resources? National Biodiesel Board – an all-encompassing biodiesel site. Triangle Clean Cities – biodiesel fact sheets, biofuels news, and upcoming events in North Carolina. National Biodiesel Accreditation Program (BQ-9000) – A voluntary quality assurance programs for distributors and marketers of biodiesel. What is the National Biodiesel Board? The National Biodiesel Board was founded by soybean farmers and is the national trade association for the biodiesel industry. The NBB website contains comprehensive information on producing, marketing, purchasing and using biodiesel, and is the source of technical information on fuel standards, testing, tax incentives, and much more.